Ask fellow campers about "Allatoona Landing Campground" and nearby attractions. We stayed one night. Electric and water only, site just big enough to park our 25ft travel trailer. Ram 1500 TV had to park next door on mulched yard. Down hill site. Fire ring cluttered. Large pine tree too close to site to allow awning to open fully. Trees on the other side close to site required careful parking to allow room for slide out. Our site was right next to the entrance/exit gate, lots of traffic going by. Other sites farther away may not be as noisy. Dog droppings near site. A railroad runs within 100 ft and is very active with as many as 3 trains per hour, all with loud horns, thundering by at all hours of the day and night. The roads used to get to the campground are not the best, narrow and choppy. We have paid less for much better. Restrooms were clean and recently upgraded or constructed. Nice tile floors and shower walls. Would not stay here again. We camped at Allatoona Landing Campground in a Travel Trailer. Great stop over traveling from Tenn to south of Atlanta during the week. You do not want to go thru Atlanta except Sat or Sun if you can help it. We stayed here a few times. It isn't far from 75. Easy in and out and nice to be on the lake to go for a walk after your long day of driving. Great lake front sites and plenty of room to walk around. Different types of sites, most without sewer but there are a few with and you can dump your grey water in grey water areas marked. Full easy to access dump as you leave the CG. We had a very steep site this time but it was a large pull thru - we wanted to stay hooked up and it met our needs. Might ask, if level is important to you. Ducks around everywhere that are very friendly. Great verizon service and over the air channels worked ok. They do have cable but we did not utilize. Trees everywhere so not always sat friendly unless u can move yours around. Lovely rolling park like setting. They have a marina for your boat and a small store with basics. Between the Lake and the Pool, it is a nice summer visit. 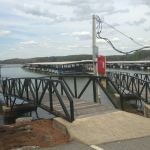 We camped at Allatoona Landing Campground in a Fifth Wheel. Great views on the peninsula of Lake Allatoona. These amazing views could have made up for the park deficits, though in my view, were not sufficient to change my overall negative review. There are very few sites that have sewer hook-ups at this park. Every Tuesday, they have a service that costs $25 to dump both gray and black water tanks. Most of the sites are unpaved. Most sites are rather highly sloped. A great many of the sites are unpaved. The restrooms were reasonably clean, though not air conditioned. A few of the sites which seemed occupied by longer-term patrons were unkempt with personal belongings. The laundry facility had 3 working, older model, top loading washing machines and 3 very old functioning dryers. Patrons are largely rule-abiding, though they don't enforce the two-vehicle limit rule such that certain areas in the campground seemed like a parking lot. Sadly, I experienced a decidedly agitated patron in the laundry room who offered a direct physical threat. Having sought help from the management office, I was unable to feel comfortable that they would control the agitated man whose profanity and direct physical threats were of great concern. Feeling unsafe, I left the campground early without an offer of an apology by the campground or a refund for the days unused. We camped at Allatoona Landing Campground in a Motorhome. Lovely park right on the lake. Only drawback are the trains which run thru the night and are very close to the park. We could see them from our RV. 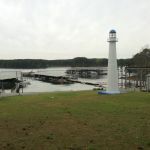 We camped at Allatoona Landing Campground in a Travel Trailer. Very pricey considering this campground. Full hookup, pull thru. Water pressure is not the best. They charge an extra 3.00 for electric? Trains every hour! However, it's woodsy with pines everywhere and peaceful most of the time. Some sites have cable. We camped at Allatoona Landing Campground in a Motorhome. When I made the reservation, I indicated that we had a 40ft. fifth wheel. Unfortunately, due to traffic going through Atlanta, we arrived after dark, and learned that the spot were assigned to had several "challenges." Firstly, the spot was uneven and exactly 45 feet long and no maneuvering room from the access street to correctly align the rig. Also, the electric box was at the back of the site, so the RV couldn't overhang. Then after a lengthy maneuvering time, we were ready to hook up and then noticed that there was no water hookup next to site!!! So the next morning, we went to get a longer hose so that we could hook up to the empty site next to us. We did learn some lessons on this campground stay: review the site and accessibility first. If not acceptable, then move to an empty spot. Lastly, be prepared to be woken up by a very active train track nearby. We camped at Allatoona Landing Campground in a Fifth Wheel. The park was not well kept. RV sites were impossible to get your RV leveled - and we were not the only ones! Practically everyone in the park looked lopsided - it was almost comical, but made for uncomfortable living. After all of the rain, the sites were fairly damp and muddy - the camp failed to keep up with their landscaping. WiFi was NON EXISTENT! We called down to the office everyday and nothing was done. The laundry room was a disaster; it was filthy and 2 out of the 4 dryers did not work! The washing machines were very dirty and not maintained well - sounded like they were going to blow up at any moment. This isn't a place we will stay again. 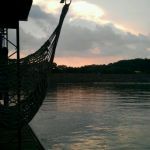 We camped at Allatoona Landing Campground in a Travel Trailer. Nothing close by, so be sure to be stocked up. There is a Walmart in Cartersville off of exit 287 going west. Campground has a beautiful wooded setting and some sites have a view of Lake Allatoona. The roads are narrow which makes maneuvering in a 40 foot challenging. Our site was not level both front to back and side to side, took us forever to get anywhere close to level. We noticed that many of the sites were very off level. There are some park models which appeared to be long term residents, not all of them were in good repair. Appears to be a family friendly park. No dog park, but there are areas to walk the dog. We camped at Allatoona Landing Campground in a Motorhome. Take the short walk from the park to the Allatoona Pass Battleground which depicts the civil war battle for Allatoona Pass. Our site was extremely narrow and not level. Even with our leveling system, we were still off kilter and our stairs wouldn't extend out. The area adjacent to RV was not paved and so hilly it was difficult to position chairs. And then the ant's invaded! Little black ant's everywhere. 2 days later and we are still finding ants inside. So glad they weren't fire ants. But beyond these items, it is a nice campground. Seems pretty clean, gated, quiet except the trains which didn't bother us. Staff very pleasant. We camped at Allatoona Landing Campground in a Motorhome. Nice location just north of Marietta; on the water; lots of trees & shade. Grounds were in great shape. We camped at Allatoona Landing Campground in a Motorhome. Park was clean and off the highway so no noise there, but very near a train track and train whistles both evening and during the night while we were there. Power and sewer connections mid site. Cable TV was fuzzy. Better reception OTA. Strong Verizon signal. Parking pad was not level, sloping both down and left requiring maximum jack extension. Other sites I saw appeared to be more level. No dog run, but plenty of room to exercise your pal. Okay for an overnight stop. On the lake so if you are into boating it might work out well for you. We camped at Allatoona Landing Campground in a Motorhome. The park staff was friendly and courteous when checking in and very helpful on the phone when making same day reservations. The campground is very clean, well kept up and has a "state park" feel with lots of full hookups. As in the other reviews, sites are not very level and takes a bit to get level enough. Sites are spaced apart nicely for a private park. The park is gated. Was not sure what to expect as we drove down a long rather narrow paved road in the middle of the hills and woods. Was pleasantly surprised. We camped at Allatoona Landing Campground in a Motorhome. Our first time staying here with our 18' travel trailer. This is a very social campground. Sites are close together and people visit. We liked it. Our neighbor (who full-times going back and forth between 2 parks) introduced us to several other campers who were very friendly and welcoming. We also meet several others on our own. Hookups are weird in that they are in front of the pads, meaning power and water have to run under the camper or around. Barely made it with our 30' water hose. Also used every bit of our leveling blocks to get somewhat level. Only downside is we were 2 hours late checking out (our own fault) and were charged a full night's rate. We will definitely return here and pay attention to the time on check-out day :) We camped at Allatoona Landing Campground in a Travel Trailer. Just a quick one nighter! A real forest feel to the place; felt like camping. Plenty of room to maneuver our 57' total length. Gated access with a code. We would stay again and longer next go-a-round. We camped at Allatoona Landing Campground in a Fifth Wheel. We overnighted here on the way south this year actually in August. the place has plenty of room and was easy to get around in our large fifth wheel. We had a spot right on the water and there were lovely ducks to feed. It was only an over nighter for us but good place it seemed. This was the end of August and not a huge crowd. A would think it would be busy in the summer with the lake. The Verizon card worked and we had no issues. We camped at Allatoona Landing Campground in a Fifth Wheel. 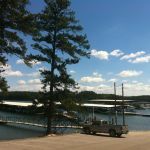 Are you affiliated with Allatoona Landing Campground ?